Hagerstown, MD. 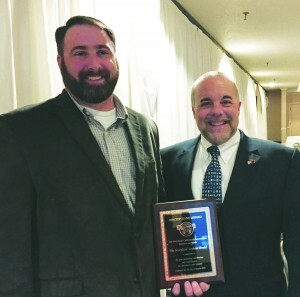 (March 29, 2016) – The Maryland Soybean Board received the Top Hand Award from the Maryland Cattlemen’s Association during its annual convention earlier this month. The Top Hand Award recognizes an individual or organization that has contributed significantly to the benefit of the Maryland cattle industry. On behalf of the Maryland Soybean Board, Alan Hudson, a MSB director and a farmer from Berlin, Md., accepted the Top Hand Award from the Maryland Cattlemen’s Association’s director Dr. Scott Barao. Livestock and poultry consume more than 98 percent of domestic soybean meal. The soybean board supports those industries with programs that include opportunities for farmers to train as spokespeople on behalf of agriculture. One part of this program, CommonGround, supports farm women reaching out to their non-farming peers. Shares both an environmental audit and economic analysis of animal agriculture produced by the United Soybean Board and customized to each state. Sponsors the annual cattlemen’s Youth Skill-A-Thon and youth livestock shows in Central and Southern Maryland. Launched the consumer outreach campaign, “My Maryland Farmers,” at the 2015 Maryland State Fair, featuring local farmers and facts about their farms and Maryland agriculture. This year, the soybean board funded more than $228,000 in research projects. It also promotes the use of soy-based products through an annual competitive grant program to county fairs and agricultural expos. Ten Maryland farmer-directors lead the Maryland Soybean Board: William Layton of Vienna, chairman; Travis Hutchison of Cordova, vice chairman; Danny Saathoff of Denton, treasurer; Alan Hudson of Berlin; Randy Stabler of Brookeville; Linda Burrier of Union Bridge; Josh Appenzeller of Millington; Bill Langenfelder of Worton; Jeffrey Griffith of Lothian; and Brian Johnson of Westover. About Maryland Soybean Board: The Maryland Soybean Board administers soybeancheckoff funds for soybean research, marketing and education programs in the state. One-half of the checkoff funds stay in Maryland for programs; the other half is sent to the United Soybean Board. To learn more about the Maryland Soybean Board, visit www.mdsoy.com.